What if Italian Americans fought investigation of the mob the way some U.S. Muslim groups object to counter-terrorism probes? Eighty-seven years ago yesterday, Al Capone's South Side gang lured leading members of Bugs Moran's North Side Irish gang into a Chicago garage and gunned them down execution style in what became known as the St. Valentine's Day Massacre. Amid public uproar, local and federal authorities began for the first time to seriously crack down on Capone, who was listed as "public enemy" number one by the Chicago Crime Commission within a year. Imagine if Italian-American organizations had responded to all this by claiming that the Italian community was caught in the "middle" of organized crime by Irish and other gangs, that the mafia violence was the result of upheaval in Sicily and discrimination in America, and that there would have to be a comprehensive approach by government, community organizations, law enforcement, and citizens to address all gang violence and discrimination, because an approach targeting only the Italian mafia is "not going to handle it." Would anyone who heard that response have believed the organizations offering it were trying to help law enforcement, the American public, or even their own community? Or would they have believed these groups were in the pocket of the Italian mafia and using any and every excuse possible to do nothing to oppose it? Fast-forward to earlier this month, when the U.S. Council of Muslim Organizations (USCMO) held a conference of Muslim organizations in the U.S. and other Western nations. We do acknowledge the rise of extremism on both sides and therefore it is a threat to the society at large, not just the Muslim communities from let's say right-wing extremism but also from the violent extremism that comes from the Middle East as a result of the chaotic political upheaval and situation in that area and the Muslim communities in the West have been caught right in the middle trying to fight both extremism. And therefore it will take more than just the Muslim community to face these challenges but it's going to be an integral part of the government, community organizations, and law enforcement and citizens to really face this. We believe there has to be a comprehensive approach to dealing with violent extremism in any side and therefore one single approach to it we believe is not going to handle it. Let's dissect that "answer." In what has become a trope, Jammal introduces the irrelevant topic of "right-wing extremism" and uses it, first, to imply Islamist extremism is simply one aspect of a more general problem, thereby minimizing the connection between Islamism and jihadi violence. 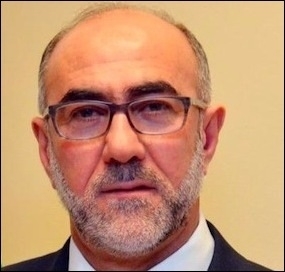 Oussama Jammal, secretary general of the U.S. Council of Muslim Organizations. Then, Jammal asserts that Islamist violence is "a result of the chaotic political upheaval and situation" in the Middle East. In other words, Islamist violence is a political problem, resulting from violence in the Middle East. Implicitly, Jammal denies any link between Islamism and Islam or its ideologies, notably the Muslim Brotherhood. One almost expects Jammal to add the claim that Islamist violence is the product of the US invasion of Iraq, as though it did not exist before. Next, Jammal opines that Muslim communities in the West "have been caught right in the middle trying to fight both extremism." Exactly what are Muslim communities in the middle of? Jammal seems to be claiming that Muslims are the victims here, of both "right-wing" and Islamist extremists. He does not offer any details of how or in what way Muslim communities are the victims of Islamist extremists. Groups like USCMO and the Council on American-Islamic Relations are not serious about fighting Islamist violence. Unsuspecting Muslim parents are certainly victimized when ISIS lures their minor children to Syria. Unfortunately, Jammal offers no response at all about whether the new coordinating body has a plan to combat the flight of young Muslims to join ISIS. Instead, Jammal laments that "it will take more than just the Muslim community to face these challenges," while insisting that there "has to be a comprehensive approach to dealing with violent extremism in any side" and "therefore one single approach to it we believe is not going to handle it." Therefore what, exactly? The implicit gist here is that, according to Jammal, neither Muslim community members nor Muslim organizations can or should do a thing to counter the lure of ISIS or prevent Islamist massacres so long as law enforcement specifically targets Islamist violence and jihadi organizations. Can one read Jammal's statement, or the many others like it by USCMO, the Council on American-Islamic Relations (CAIR), and its other member organizations, and believe that these organizations are serious about opposing Islamist violence?